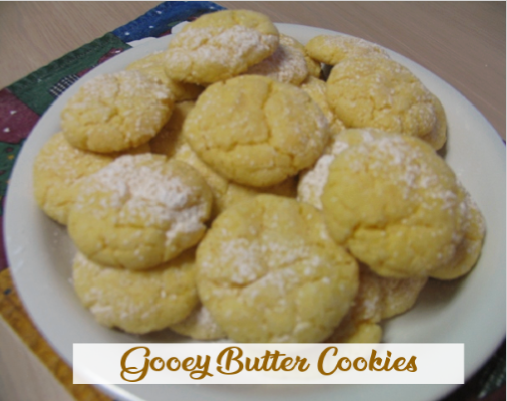 I want to share a recipe for these Gooey Butter Cookies. I found this recipe over the Christmas holiday at Priscilla’s Baking Adventures. My daughter and I have made them twice since then. These cookies are ooey and gooey in the middle and soft on the outside. The powdered sugar really makes them look so pretty. They remind me of Paula Deens Gooey Butter Cake, but in cookie form. Which got me thinking Paula Deen has couple variations to her Gooey Butter Cake, so why not make different variations to the cookies. For instance if you substituted a strawberry cake mix in this recipe that would be awesome and taste like a strawberry cheesecake cookie. You could use chocolate cake and make Chocolate Ooey Gooey Cookies and so and so on. There are several cake mix flavors on the market, lemon, chocolate chip, cherry, and more. I will definitely be trying out a few different variations, so I will let you know how it goes. When baking these cookies you really need to keep and eye on them or you can burn them very easily. These cookies are done when they start to crack on top and are golden brown on the bottom. I have really good luck when I use parchment paper to bake all my cookies on. If you want some ooey gooey goodness you need to go and bake these cookie now!!!!!! 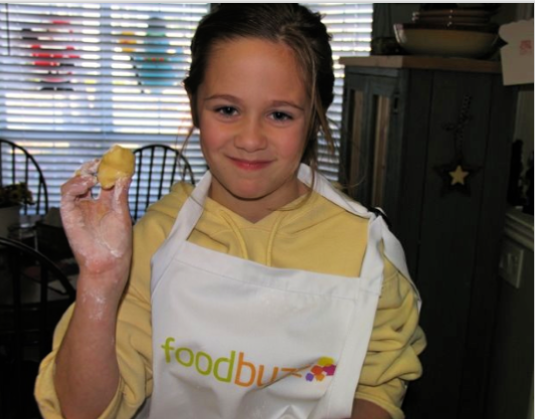 This is my daughter wearing showing you how to roll the dough into little balls. Preheat oven to 350 degrees. In a medium bowl, cream together the cream cheese and butter. Stir in egg and vanilla. Add cake mix & stir until well blended. Powder sugar your hands well. Roll balls into 1" or 2" and roll balls thoroughly in powdered sugar. Place 1" apart on un greased cookie sheets press down cookie slightly. Bake for 8 - 10 minutes. Leave on cookie sheet for 3 minutes or more before removing to cool on wire racks. Mm. These look soo good. McKenzie is so cute! I made these with a chocolate cake mix and they were SOOO good. They will be on my blog soon. The look melt-in-your mouth delicious!! Your daughter looks so cute in the apron! I have tried these as well (in fact, I just made them again tis week)! They are just like they are called...gooey! My family keeps calling them "lemon" cookies for some reason though...?... I like how easy they are an sooooo good! I love your blog, I have put the link on my blog page. I made your Cake Mix Banana Bread today and the Chicken planks.........wonderful, my guys will love it! Umm Priscilla I cant wait to try out the chocolate ones. Reeni my dd loves to dress that part. she is so funny sometimes. Hi Rachel these cookies are so hard not to like. I bet you could do a lemon cake mix in place of the yellow. Georga, thanks for stopping by MK and thank you for the kinds words. What a great idea. I've made the cake many times before, but I love the idea of these in cookies. This will be fun to play with! Thanks for sharing. OMGosh - these look sinful! In fact EVERY recipe on your blog is a "gotta try that"! What a cute little helper you have. These look easy easy. I'm bookmarking it! Do you think this could be made with a brownie mix instead of the cake mix? That's in the cupboard! I'm so glad I found your blog - the whole neighborhood LOVES your banana bread recipe! Rollercoaster, I have never tried a brownie mix. The recipe stated cake mix so I dont know on that one. For chocolate i would use a chocolate or devils food, but i know you said you dont have that. I guess you could try it. Glad to hear the banana bread was a hit. Gooey and Butter and Cookies? What can be wrong about that? I just made these with a strawberry cake mix and they are yummy! I could eat every single one! A bit messy for me with the powdered sugar - but very easy to make! Next time, I will try a lemon cake mix...I love you site!! Jennifer you beat me to making the strawberry one. I am so glad they are good that is the flavor I want to try next. I am glad you liked the recipe. Wow these cookies look and sound so yummy. I am book-marking them to make soon. Thanks for sharing. I have been making these since Paula Deen did (she did Chocolate) This Christmas, they went on all of my "neighbor cookie trays" and everyone wanted the recipe. I made chocolate ones with Andes mint chips mixed in and I made the lemon (using lemon extract as well as lemon cake) then melted white chocolate chips and drizzled them over top....simply sublime! These look and sound so delicious! I am going to make some today!! Thanks for sharing!! I recently tried these cookies but used a sugar free yellow Pillsbury cake mix. They were really good. The sugar free cake mix is hard to find though. I finally found mine at Walmart. I am going to use my Sugar free Devil's Food Cake mix tomorrow and make these cookies. This recipe makes about 2 dozen cookies. They are really quite tasty. Chocolate is also really good. I say make both LOL. I made the cookies using the butter cake mix and they were a BIG hit at our Youth Night at church!! I didn't hear one person say they didn't like them. In fact I came home with an empty platter and had people asking when I was gonna make some more. I plan to make them using a chocolate mix next. Thanks so much for sharing this recipe!! Easy and delicious is the best way to describe them. I'm so glad I needed to find the Gooey Butter Cookies recipe. My daughter is graduating from Bootcamp at the end of July and she requested the Gooey Butter Cookies. But after seeing your site I think I'll also make them with the chocolate cake mix. I made these with my three kids and boy did we have a mess but they had a blast and loved them. We just a french Vanilla cake mix but I will be using a variety this weekend. I am making a trey of these cookies for a church social. Can't wait to see how all of the different flavors pan out. Now only if we could avoid the mess in the kitchen with three little ones. Do you have any suggestions for making my own cake mix (to replace the box mix)? I found a recipe online but it calls for butter, and I hesitate to add more butter to the recipes when it already calls for so much. I these cookies! I was wondering, could you mix peanut butter in the mix? If so, how much?